Observations: How Much Would $1 Invested in the Stock Market in 19xx be Worth Now? How Much Would $1 Invested in the Dow Index in 19xx be Worth Now? This post addresses that question for "any" start-year -- and any end-year (not just "now"). The calculator works whether your initial investment was $1, $100, $10,000, or any other amount. In addition, the spreadsheet calculates the average yearly return (compound yearly growth rate) between the two years you input, and breaks out the return attributable to dividends from the return resulting from price appreciation. Note: Click on the screenshot below to expand it. The link to download the spreadsheet is at the end of the post. If you do not have spreadsheet software, see "Related Posts" below. Following is a sample of questions this spreadsheet can answer. $1 Invested in the Stock Market (Dow) in 1929 is Worth How Much Today? all dividends reinvested in the interim. As always, these returns ignore the impact of taxes, commissions and any other expenses. 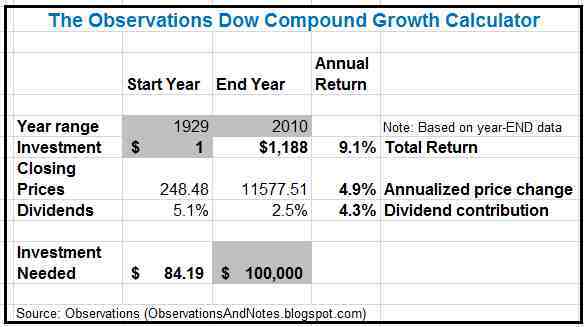 What was the Compound Annual Growth Rate of the Dow Index Between 1929 and 2010? Still on the "Investment" row, under the "Annual Return" column, we see that the investment would have returned 9.1% per year. That is, $1 growing at 9.1%/year from 1929 to 2010 would become $1188. The "Closing Prices" row shows that of that 9.1%, about 4.9% came from the increase in the price of the Dow Index (it increased from 248.48 to 11577.51). The "Dividends" row shows that of the 9.1% in total return, about 4.3% came from dividends. In addition, we see that the dividend yield was 5.1% at the end of 1929, and it dropped to 2.5% by the end of 2010. How Much Would You Have Needed to Invest to Have $100,000 Now? The "Investment Needed" row reverses the calculation -- you input the amount you want to end with. In this case, I input $100,000, and the spreadsheet calculated that in order to have $100,000 at the end of 2010 you would have had to invest $84.19 in 1929. What If You Had Invested $1,000 Invested in the Stock Market 25 Years Ago -- What Would it be Worth Now? If you were to change the start year to 1985 (25 years ago), and change the initial investment to $1,000, the spreadsheet would calculate an ending amount of $14,143. What Would $1,000 Invested in 1974 be Worth in 1999? Invest that $1,000 for the 25 years beginning year-end 1974, and you would have participated in a 25-year bull market. As a result, instead of ending with "only" $14,000, you would have ended with $47,757. What is the Value Now of $100 Invested in the Stock Market (Dow) in 1900/100 Years Ago? I have Dow closing prices back to 1900. However, my pre-1929 dividends are estimated, so I've not included that data in the spreadsheet. Between 1900 and 1929 the spreadsheet will only calculate the change in prices. FYI, I have estimated those dividends based upon another index; based upon those estimates, I calculate that one dollar invested at the beginning of 1900 (end of 1899) would have been worth over $25,000 at the end of 2012. An investment of $100 would be worth over $2,500,000! 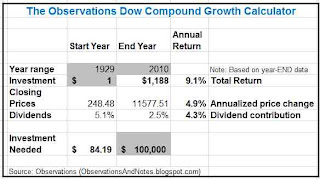 Here's the link to The Observations Dow Compound Growth Calculator/Spreadsheet. If you have problems downloading the spreadsheet, see this post. Note: You will need Excel or similar spreadsheet software on your computer. If you don't have spreadsheet software, see this post. If You Had Invested $1 in the Stock Market in 19xx (graph version): allows you to estimate results even if you do not have Excel or other spreadsheet software. What Will a $10,000 Investment be Worth in 10 Years? 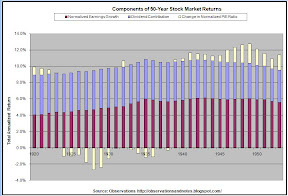 summarizes the results from many previous 10-year periods to give you a broader perspective. What Will a $100,000 Investment be Worth in 20 Years? summarizes the results from previous 20-year periods. Why Investing in the Market for Less Than 5 Years is Risky summarizes the results from previous 5-year periods. Dow Average Annual Return since 19xx lists rates of return, but not $$, for key periods such as the last 5 & 10 years. The Observations Inflation Calculator/Spreadsheet: Will calculate, for example, what that $85 in 1929 would be equivalent to in today's dollars. The Stock Market Analysis Model introduces an expanded version of the spreadsheet introduced in this post. Could you comment on the question of survivor bias in the figures typically quoted for market returns since 19xx. One is always reminded that these index return figures don't include companies that went out of business and/or were de-listed. I assume that you're using DJIA to avoid this. I guess the easy answer is that if you want to see how much a dollar invested in the Dow would be worth, you have to measure the Dow. I don't have much choice. It is what it is. Survivor bias, however, is a serious issue in a lot of mutual fund studies because the studies ignore funds that no longer exist; those companies are not in the studies at all. The Dow history does include the old companies. They are just replaced at some point with new companies. Else, you could end up with a Dow consisting of companies in industries that no longer exist.